It would seem at first that being authentic, while a valuable concept, isn’t really a yoga topic. But it’s come up in my yoga classes more than once recently—and I think I know why. 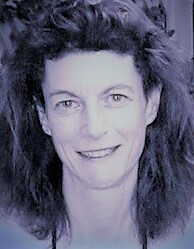 I wrote a while ago about one of my teacher’s dharma talks about vulnerability, and how being authentic isn’t possible unless we are also vulnerable. Last week, she asked us to think about how we show up in life and who we can truly be ourselves for. Authenticity seemed a natural theme for another teacher on Halloween morning. She used the concept of wearing masks to suggest that most of us are not always authentic with the people in our lives. Before I answer that question, let’s zero in on why authenticity is a yoga topic. At least I think it is. For me, one of the primary goals of practicing yoga is learning who we are. We do a lot of work on and off the mat to strip away the layers of illusion that would have us believe we are not connected or that we don’t belong. 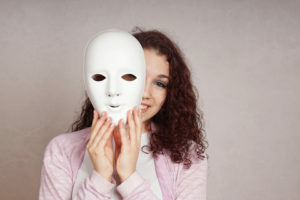 But when we talk about who we are and why we sometimes feel compelled to hide behind a mask, we may be talking about a different self—the small (ego) self that masquerades as our true (higher) self. Yoga-speak aside, I’ll be honest. And I don’t think this will be a surprise. I often say I’m okay when I’m not. I acknowledge that, because both of my yoga teachers suggested we are hiding our truth when we we’re not okay but say we are. My guess is you’ve done this too. Maybe for a good reason. After reflecting on these two teachers’ dharma talks, I decided to take off my mask a few days ago. I thought, why not admit to a friend that I’ve been struggling with a few things? It didn’t go well. My friend more or less changed the subject. I’m okay with that, though. In fact, I expected it. It’s why I—and I’ll bet why you—wear masks more often than not. Authenticity is great, but let’s face it. Most people are not comfortable with other people’s struggles. I saw a post on social media that suggested “it’s okay to not be okay.” And I thought, sure it is. But it’s not comfortable. Maybe we wear masks to protect people we care about. We don’t want to bring them down. I don’t think that’s a bad thing, as long as we find ways to cope with not being okay. For me, that’s where yoga comes in, and why I think authenticity, vulnerability, and mask-wearing are all yoga topics. Yoga helps me manage the trials of life better, which means there’s a little less I have to burden others with. Am I saying we should never reveal our darkness and demons? No, I certainly am not. I’m just saying there’s a reason we wear masks. I think God gave us coping mechanisms for a good reason. Masks aren’t a problem unless we forget they are masks. If we can make our masks a bit more transparent then we’d like them to be, we’ll probably establish more authentic connections with others, even if taking that risk doesn’t always pay off. First, though, we have to know ourselves. That’s the yoga. If we all knew who we truly are, we would not need to wear masks. And we wouldn’t need others to wear them either. We’d see that we are all connected, we all belong, and we are all worth seeing just as we are.